The ongoing membership support of our thousands of organizational members helps ALA fight - and win - on issues that matter to libraries. When libraries join or renew ALA membership, they enable ALA to continue important advocacy work and confront new issues. All libraries are models of doing "more with less" as you serve your community. When times are tough you cut, conserve, and improvise, keeping the doors to information open. 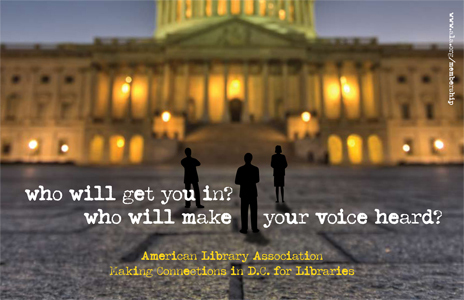 ALA supports your library and your personal efforts your efforts with new tools and ideas while redoubling our advocacy efforts in Washington, D.C. and around the states. Like you, we have been successful doing more with less— and it is membership from libraries that enable ALA to do all it does. Your organizational membership is our lifeblood that enable us to advocate for the profession. Your library can support ALA's work by becoming a member today. Adding your library to ALA's membership rolls supports our Office for Library Advocacy, the national coordinator for state and local advocacy efforts; the ALA Washington Office and its professional staff who works in the halls of Congress for libraries; and the Public Information Office as as it showcases library stories and the value of libraries to their communities in newspapers, on the radio, social media, and across the internet. Please take an important step and add your library to our member roster. Your membership support, ensures ALA can continue to fight the good fight for libraries of all kinds. Make organizational membership in ALA — and all we do for libraries and the profession—a permanent part of your budget. Call or click to get started today.